Ain’t life just like that sometimes?? The very last night of NaBloPoMo and TONIGHT I develop IT troubles. It started with problems with the internet browser and after reopening Internet Explorer a few times I though I would re-start the machine to see if that sorted it out. Only… when I restarted it, Windows refused to boot up fully. Great. So here I am in the dead of night in Windows safe mode, trying to get one last lousy post done. So forgive my brevity! Cast your mind back to Spring – time of buds and shoots, nodding daffodils, carpets of crocuses and… my birthday! This year I opted for lunch with Johanna on the Big Day and a quiet lunch a deux with Nick the following day. We had one of my favourite treats: roast duck (I believe it may even have been another Nigel Slater recipe which I’ll have to share with you sometime soon). A lovely afternoon was had by all, eating the perfectly crisped roast duck and sipping the sublime Graham Beck Cuvee 2000 sparkling wine, carefully brought back all the way from South Africa. And after all the plates had been licked and the last drop of champagne drained, all that remained were the dishes to be done and one picked-clean duck carcass. I couldn’t just throw it away, so into the pot it went together with enough water to cover it, a roughly chopped carrot, onion and stick of celery; a bay leaf; and some peppercorns. An hour or two of slow boiling, a quick pour through the strainer, and voila! Duck stock! While cleaning out the freezer the other day, Nick came across a container full of what looked like particularly unappetising brown liquid which he was regarding with distaste just as I was wondering what to make for dinner. The duck stock that came in from the cold, so to speak. I defrosted it and the smell for some reason brought to mind the autumnal flavour of mushrooms. A peek into the fridge revealed a punnet of chestnut mushrooms – hurrah! And so was born my very first duck-and-mushroom soup, with a splash of truffle oil. The duck stock is the perfect base for this, although I’m sure that chcicken stock would be just fine. Add the chicken stock gradually, stirring carefully to prevent lumps. Add the milk and stir. Remove from the heat and give it a whirl with an immersion blender to get a really smooth consistency. Stir in the cream and return to the heat to heat through. Add salt and pepper to taste. Serve garnished with parsley leaves and a few drops of truffle oil. 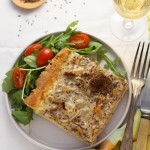 NOTES: This is dead easy to make and the truffle oil adds a touch of luxury, but is by no means essential. Something about the flavour of the duck stock works with the mushrooms and thyme as if they were made for one another. A match made in heaven! 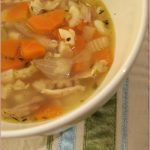 I’m submitting this post as my entry to this week’s Weekend Herb Blogging, kindly hosted by event founder Kalyn’s Kitchen this week. – send your entries to her today at kalynskitchen (at) comcast (dot) net. Oh, yes, I do love a bowl of steaming hot creamy mushroom soup. Thanks for reminding me to make this, as I haven’t in ages! It looks lovely, Jeanne. hi. i’m just loving your site! found it when searching for a squash recipe. now, i’m a resident south african – tied to the red soil and the sea… with a genuine love of local foods. when conversation steers toward immigration, i’m genrally the one who claims an inability to live without the food and music of this place! so, here’s an offer… if anybody is having difficulty tracking down an obscure home recipe… i’d be happy to help. i have heaps of traditional recipe books lying about, both dutch in origin and african. anything from ‘impossible pie’ (the all in one coconut tart that forms its own crust) to imifino/marogo. pop a mail off to mamamort@hotmail.com and i’ll see what i can do. seriously jeanne, a restaurant would charge big bucks for this. you are a wonderful cook. Truffle oil and mushroom soup are so great together, and basing it on a duck carcass – exactly the right way to go. How much is a punnet??? It sounds like you did the right thing with that stock – I imagine it was all very tasty. Congrats on making it to the end of NaBloPoMo; hope you feel like you’re allowed to take a break for a day or two! Sounds wonderful. NIce photo too. Aside from feeling dreadfully for that poor killed duck… (agh, siestog! ), I have to tell you that just reading that recipe has left me drooling all over my keyboard. Then again, perhaps it’s because I know what it will taste like since your recipe seems to be very much the same as the one I concocted! I always think it’s the thyme that adds that extra edge. wow, duck stock, i’ve not come across canned or carton ones yet and have not ventured into making my own mushroom soup from scratch yet. would love to try out. i like to use canned mushroom soup as a base for creamy pasta sauce. however all the spices and herbs and ingredients added would make campbell totally unrecognizable!